Truth be told, I actually made the pork of death on Christmas Eve, along with other deep-fried delicacies, one of which is this Thai appetizer, mu sarong (pork wrapped in noodles). “Sarong” means just what you’d expect: wrap, just like the article of clothing. I first had mu sarong at a local Thai restaurant years and years ago, and was recently reminded of it after looking in a Thai cookbook at a bookstore. So, what better for a Christmas Eve appetizer than Mu Sarong (and deep-fried porkbelly and a yet-to-be posted deep-fried treat)? These are made with ground pork, but there’s also a shrimp version, called Goong Sarong, which I’m sure is also really good. There are a variety of versions of this recipe, so I read a few and made them like you see here. Rolled, wrapped and ready for deep-frying. Boil some water and cook the noodles for about 30 seconds, just until soft and pliable. Drain, rinse and set aside to cool. In a medium bowl, mix all of the remaining ingredients. Using your hands works well, but even better with nitrile disposable gloves for easy cleanup. I saw some recipes that called for adding an egg or egg yolk to help bind the ingredients together. I did this, but it did not really work. The egg was too slimy and made the mixture too wet to bind well. I fixed this by adding panko, which soaked up the slime and allowed the mixture to be rolled into balls. You can combine two next steps, or complete them in sequence. Using your fingers, divide and roll the mixture into even-sized balls, about 1.5 to 2 inches in diameter. You can do them all at once, or one at a time, adding the next step for each ball. 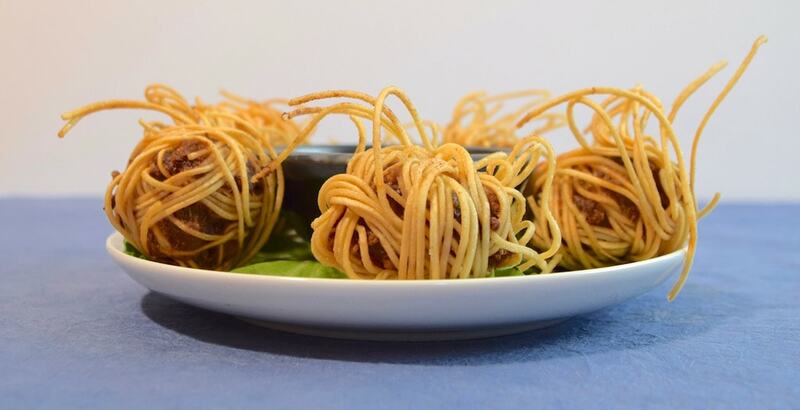 When a ball is rolled, take some strands of noodles and wrap them around the ball of meat, turning it on its axis as you wind the noodles, as shown in the photo. 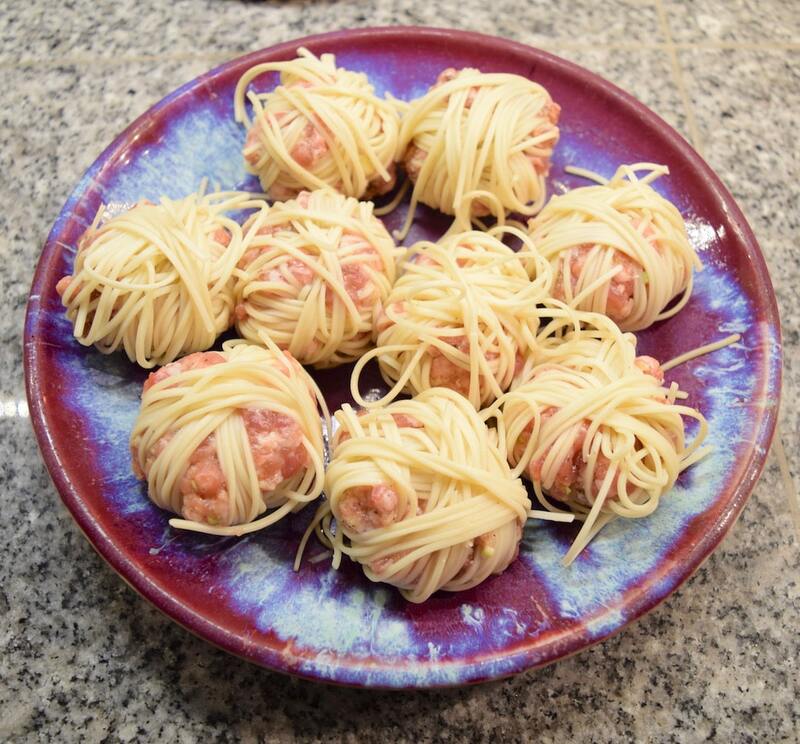 I looked at a lot of photos of these, and some show the meat completely covered by noodles. Others were just mostly covered, like I did with mine. Some of mine had purposeful (and literal) loose ends, which gives them a feral look when cooked. Once you have all the balls rolled and wrapped, it’s time to fry them. Submerge them in 350-degree oil—in batches—and fry for about 4-6 minutes. Before cooking a whole batch, though, it may be a good idea to test one first to see if the duration you chose fully cooked the meat. 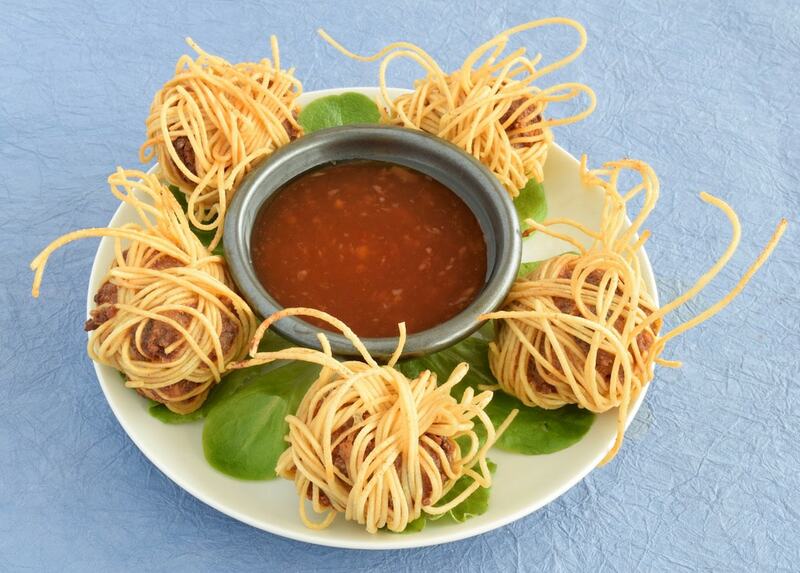 Drain on a paper towel when done, and serve hot with sweet chili (spring roll) sauce for dipping.